He spat and held out his empty hand. “The wineskin, Giovanni,” he said, but the boy wasn’t listening; he was staring wistfully up at the villa, where cascades of laughter had just then burst from the courtyard. Giovanni may have been young, but the boy was every bit as tall as Pietro himself – and taller now that he stood while the dwarf sat. He eyed Pietro disdainfully, and seemed poised to disobey, but at last he handed him the skin. Pietro uncorked the skin, took a long drink and wiped his mouth with his sleeve. Pietro smirked. He would have gone on, but his thirst was strong. 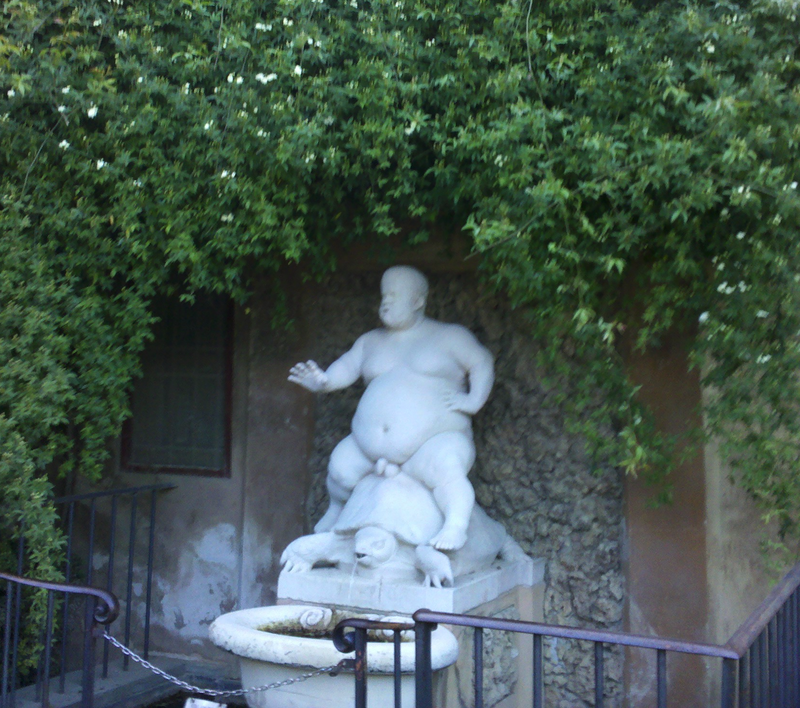 He emptied the skin and tossed it into the fountain. Haha, oh I know, I know — all too clear. Thanks for reading though! I’ll be getting to the list later today I think. I like this! It is interesting where our minds go sometimes isn’t it? Great job on this. I really like this. I feel like it rolls around in my mind like wine would in my mouth. Excellent. The imagination flows when we allow it to, doesn’t it? A statue of the jester but not of the noble is its own reward. Nice take on the prompt. Your writing is strong and confident. They carry the story in an invisible hand, instead of eat it with an overbearing mouth. That’s a rare trait. Rare, indeed. This is one of the most interesting takes on the prompt I’ve read so far; I’d enjoy reading more of Pietro. Well done. And my, that is quite a statue. Thanks, Annabelle – I appreciate that! He was fun to write, so it’s quite possible he’ll make another appearance someday. Wow! Couldn’t help thinking of Tyrion Lannister, and the similar themes of physical appearance forcing people to play roles publicly that are nothing like they are privately. Well done. You gave that statue life. And a story. Brilliantly done, your visuals were perfectly sculpted. Giovanni is in for a lot of abuse from Pietro, but seems up to the task. This is the start of a very interesting story. Very nice write. You have some really great turns of phrase here. I love, fall from his lips like dribbled port. Nice work. Thanks for linking up! Thanks – it was my first time doing the Trifecta, so thanks for stopping by!